UCF researchers comprise the only university team left standing in a national competition with a grand prize of $250,000. 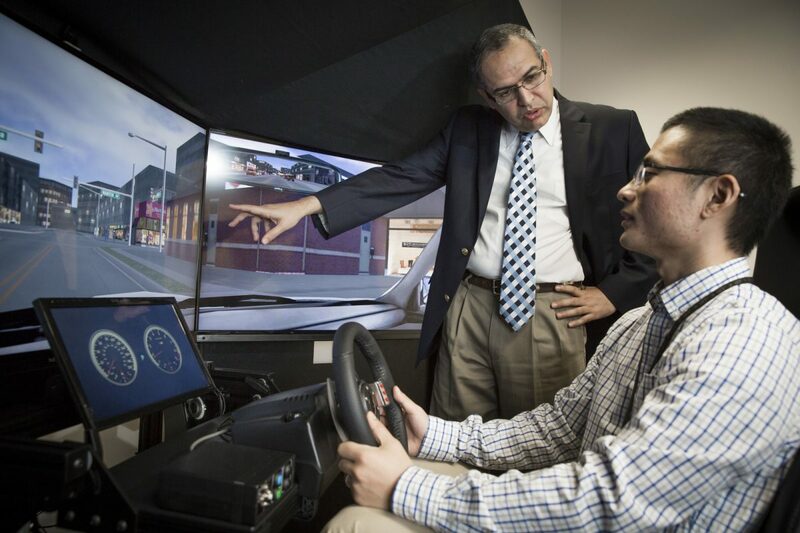 UCF researchers have beat nearly 50 other teams in a national traffic-safety-improvement competition and now find themselves the only university team competing among industry giants such as Ford and Uber. Their entry, Real-Time Crash Visualization Tools for Traffic Safety Management, is a computer program that uses big data to predict, and hopefully prevent, traffic accidents before they happen. Using information including real-time traffic data, weather, history of past accidents and violations, and other data, the program predicts if the risk of an accident is increasing or decreasing and presents the probability in an easy-to-understand visual readout alongside a map overlaid with current traffic-flow conditions. The national competition, known as the Solving for Safety Visualization Challenge, is sponsored by the U.S. Department of Transportation. Abdel-Aty’s team has progressed to stage II of the competition. They will find out in January if they become one of the two finalists to progress to stage III. The winning team will receive $250,000. Abdel-Aty says his team’s tool represents a proactive approach to helping vehicular travel become less dangerous by recognizing dangerous roadways, intersections and conditions before the statistics about their hazards pile up. Abdel-Aty says he’s proud to have been selected as semifinalist in the competition and have the chance to have his research implemented into practice. Abdel-Aty received his doctorate in civil engineering from the University of California, Davis, and his master’s and bachelor’s of science degrees in civil engineering from Alexandria University. He joined UCF in 1995. The research team was comprised of students and researchers from the College of Engineering and Computer Science, including students: Yina Wu, Jinghui Yuan, Morgan Morris,Qing Cai, Yaogang Gong, Ou Zheng, Jacob Lites, Jiajia Dong, Whoibin Chung, Moatz Saad, Lishengsa, Jorge Ugan Yue, Shile Zhang, Zubayer Islam, Md Sharikur Rahman, Md Hasibur Rahman and professors Samiul Hasan and Jaeyong Lee.